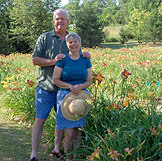 All flowers are field grown on our farm! Please contact us with questions or to make an appointment. For a limited time until 2015 we will still be selling seedlings and clumps until they move to their new home with the new owner Daylily Valley Farm, 300 Tyro Road, Baden, PA, 15005.